5 STAR UPGRADE! REMODELED 1 BR Oceanfront ~ Sleeps 6! 5 Star Remodel- Maui Vacation Rental at the Royal Kahana. 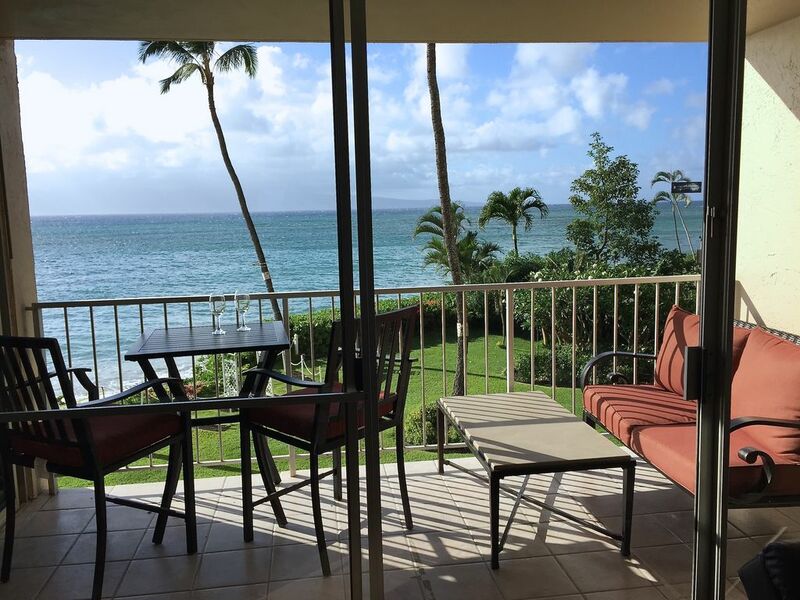 Romantic Direct Oceanfront Vacation Rental at the Royal Kahana in West Maui, close to Lahaina, and Between Kaanapali and Kapalua. Watch the Sunset over Molokai, and the Whales when in Season. Sleep to the Beautiful Music of the Ocean Waves. REMODELED & Interior Designed Jan 2016! Remodeled Kitchen w/ Granite Counter Tops, Stainless Steel Appliances, Cooktop, Microwave Convection, 2 HD TV's 37" and 50" 1080p, and an Apple TV for watching your iTunes collection or using it as a Pay per View, Desktop Computer with FREE High Speed Internet, Free local phone calls and FREE Wi-Fi High Speed Internet for laptops, iPads and wireless devices; all this in a resort condo/hotel setting at the Royal Kahana. Free parking Pass & Wi-fi Included. NO Hidden resort or check in fees! Photos to be updated on 09/01/12. Sleeps up to 6 comfortably! The Royal Kahana features sparkling pool with cabana and BBQ's, direct oceanfront with swimmable beach, free parking, activities concierge. Perfect honeymoon or vacation getaway with romantic beaches and several world championship golf courses! Hurry! Books fast, make your reservation today! Direct Oceanfront Views in a Spacious 1 Bedroom. Free Parking, FREE Wi-fi, Free Local Calls. Our family of 5 really enjoyed staying here during our trip to Maui at the end of March. The views were even better than the pictures...I'm not sure we could get much closer to the water. We woke up our first morning to 3 whales right outside our lanai! It was clean (which is not easy with all the sand from the beaches!) & had everything we needed for the week. The beach towels, chairs & umbrella were really useful & the in-room laundry was also a nice bonus that we didn't think we needed, but used several times. The location was perfect for all west side activities, and now that we know the island a bit better...we would stay on the west side again. There is a great variety of beaches ranging from calm for little ones & snorkeling, to more active for body, boogie & real surfing for the older kids. It was also minutes from other conveniences like restaurants & groceries. We also found the on-site concierge services very friendly & useful. John was very responsive and helpful to any of my questions. We would definitely recommend staying here to anyone! I was so disappointed in the condo we rented. I read all the reviews before we booked it, and only 1 or 2 sounded negative. It all sounded so good on the VRBO website, but it was a big disappointment. Most of the furniture was in very poor condition, with holes and the curtains were ripped and had holes, the bed had no skirt around the box springs, just leaving it exposed, the bedroom window casing is bubbled up and dark and you can't really see well out of that window. The bathroom shower drained so slow, that if you wanted to shower and wash your hair, you had to turn off the shower and wait for it to drain to have more than 5 minutes. And there is no beach as the pictures show. It has all been washed away, and there are black sand bags instead. Also, we never even went to the pool as it looked bad, and you can't see the ocean from the pool as it is blocked off. The wiring on the TV set up in the living area looks like something out of India. Wires everywhere. And we had to go buy batteries for the remotes. On a good note, the owner was very nice when we had to call him about getting the internet and TV to work, and the stackable washer/dryer unit works well. I would definitely not recommend staying in this condo. Our sincerest apologies, that you did not see our instructions if you encountered any maintenance issues, which may have resulted in a compounded negative review. Its very simple, per the instructions to call the on island maintenance company that would have contacted a plumber to resolve the plumbing issues with the shower. We have responded by having the plumber to inspect and clear the drain lines and wish you would have reached out to us during your stay. On the upside - views are amazing (but unfortunately no view of the sunset given the direction of the condo); condo is clean; almost every amenity needed is there (kitchen ware, cooler, beach chairs, extra towels, etc. ); condo is roomy; ample parking; and check-in is super easy. On the downside: as others have stated, the air conditioning struggles to get below 70, would not want to be there in summer, and has a slightly musty smell; the bed is just weird, the bed topper has distinct lumps/groves that are hard to get out of; condo is definitely in need of maintenance; mold in the dishwasher and washer are off putting; and the shower doesn't drain properly. Thank you for your comments, I wish you had contacted us during your stay, as we have a property management company that can address the issues. The plumber was dispatched once I saw the review to have the shower lines cleared, and wish you had given us notice, so we could have had a plumber there during your stay to address the shower and dishwasher. It was reported there was solid foods in the dishwasher, so perhaps you did not clear the plates fully prior to putting in dishwasher, and excess hair in the shower drain line, which has been cleared. Maui can be humid, and if ANY windows are left open during the AC, it will not properly cool. The AC has been tested, and can get down to 69F. The memory foam mattress topper is a Thick 4" topper and can be removed. Some people like it and others think its too soft... A New Mattress has been ordered, which will be a balanced comfort. Thank you again for your comments, and we have addressed these concerns so that they should not be issues for the future. We enjoyed morning coffee on the balcony watching the whales. Everything worked just fine. It was a great place to spend a vacation for two. Wonderful experience, would definitely recommend to friends and would love to stay again! This place is perfect! Gorgeous views, well maintained property! We loved our stay here! This place is amazing and everything you could hope for while staying in Maui! My husband and I rented this condo to celebrate our 20th wedding anniversary and it was a perfect visit. The views are beyond belief, we literally spent hours on the balcony. The place was clean, had nice little amenities for us and was just charming overall! John’s welcome email was prompt and so thorough with directions, hints about the condo and recommendations while in Maui. I would highly recommend staying here! We had a incredible week and look forward to celebrating another anniversary in this magical place. 2 Night Minimum only if check out date coincides with a same day check in or your check in coincides with a same day check out. Otherwise, Any Gaps or Open Calendar is a 5 night minimum. 50% Deposit Required at time of Reservations. Cancellation policy: Payments are non-refundable. Recommendation to purchase travel insurance in case of emergencies.